Unfortunately for the Jews, the Assyrians did not hold West Asia for very much longer. During the 700s BC, the Assyrians began to lose power. What were Israel and Judah? This meant that the Jews could be more independent of the Assyrians. But their neighbors were also more independent. So this also meant that the Jews had to fight many small wars with their neighbors. Some of the wars were between Israel and Judah. Others were civil wars within one country over who would be king. They fought other wars with the Canaanites. During the 600s BC the Egyptians managed to reconquer Israel and even part of Syria. But when the Assyrian Empire really fell completely apart, a new empire started up which had its center at Babylon. 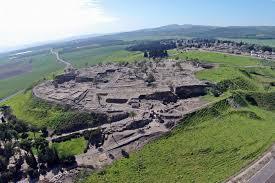 The Jews under their king Josiah did their best to support the Assyrians. In the last big battle between the Assyrians and the Babylonians, the Egyptians sent help to the Babylonians. Josiah and the Jews fought the Egyptians at the battle of Megiddo (me-GID-oh) and prevented them from getting to Babylon (BA-buh-lon). Josiah died in the battle. But that’s the losing side. But the Assyrians lost the battle anyway. The Babylonians soon took over most of West Asia. So they took over both Israel and Judah. Because the Jews had fought on the side of the Assyrians, the Babylonians thought the Jews were troublemakers. So the Babylonians destroyed the Temple that Solomon had built (the First Temple), and took many of the richer Jews prisoner, both men and women, and their children, and took them away to Babylon where they could keep an eye on them. This is called the Babylonian Captivity. Isaiah, Jeremiah, and Ezekiel all wrote sad lamentations about the destruction of Jerusalem and the Temple, which are in the Bible (the book of Prophets). 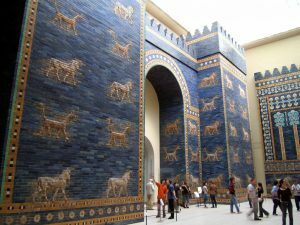 The Ishtar Gate of ancient Babylon, built during the Neo-Babylonian period (600s BC). Now in Berlin. 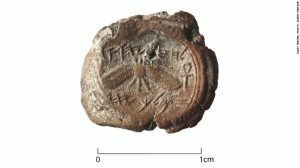 During the Babylonian Captivity, two religious leaders were important. Their names were Ezra and Nehemiah. Both Ezra and Nehemiah looked for reasons why God had allowed this terrible thing to happen to the Jews. They thought that it was because the Jews had not observed the Law (the Ten Commandments) carefully enough. The Jews had not kept up their side of the Covenant, so God had not kept up his side either. Ezra and Nehemiah persuaded many of the Jews in Babylon to begin observing the Law much more carefully than before. In 539 BC, however, Cyrus the Persian conquered Babylon, and all of West Asia from modern Pakistan to Turkey. Cyrus acknowledged a right to religious freedom, and let the Jews return home to Israel. Cite this page: Carr, K.E. Babylonian captivity – Jewish history. Quatr.us Study Guides, August 23, 2017. Web. April 23, 2019.